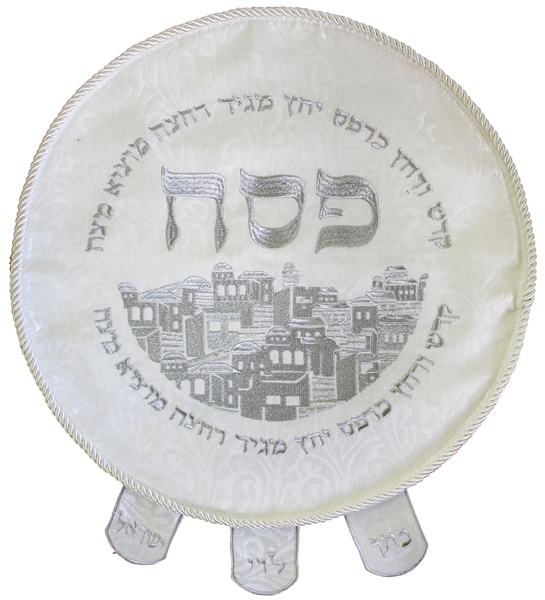 This elegant round matzah cover is made from heavy brocade material. The matzah cover is masterfully embroidered with the Jerusalem skyline fit in a semi-circle. Above the Jerusalem skyline the Hebrew words “Pesach”, Passover, is elegantly embroidered. The “steps” of the Seder night, up until the eating of the matzah, are embroidered in Hebrew above and under the design. The matzah cover is finished with a nice silver trim and a multi thread scalloped edge around the edge. The matzah cover has three pockets attached underneath that can accommodate three individual round matzahs. There are three is a unique “tabs”, each labeled with the name of the matzah in the pocket, “Kohen”, “Levi” and “Yisroel”, allowing quick and easy access to the proper pocket. The matzah cover includes a plastic protective cover.